I’m clearly still new at this, so bear with me while I learn all the ropes. But I have so much to share and so many things that I’m working or want to work on. I wake up thinking about what I’m going to sew today! At least I can laugh at myself. I just want to catch you all up on what I’m currently in the process of working on. I’m participating in a couple of “group” activities. Both are completely new for me and I’m really enjoying the collaboration that comes with so many people working on the same project. 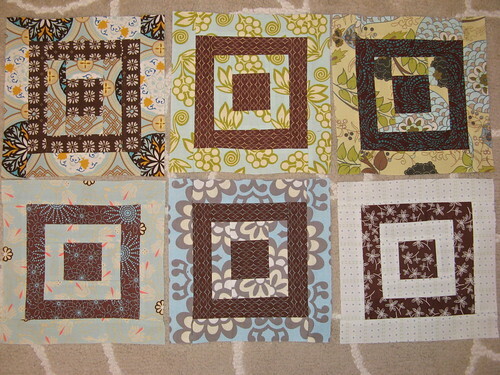 First of all, I’m involved in the Row Robin Quilt Swap hosted by Tab over at Enjoying Life’s Journey. There were so many of us, that we ended up divided into 3 groups. But I really enjoy following all the groups’ progress with their different rows. At this point everyone should have made and sent their own off to the next person, so I think that it may start to get really interesting soon. We’ll see if everyone really does like what other people are making for them 😉 So far, there are some wonderful rows, so I’m sure that it will turn out great! I hemmed and hawed over my row before finally deciding on a double wedding ring pattern. I really love some of the fabrics in this, especially the little frogs. I’ll be honest, I really love ALL the fabrics in this! It’s always good to make something that you love. I even made some log cabin blocks. I’ll probably use these on the back now. I was trying to make them for my row, but it just wasn’t working for me. But I really like them now with the wedding ring row. 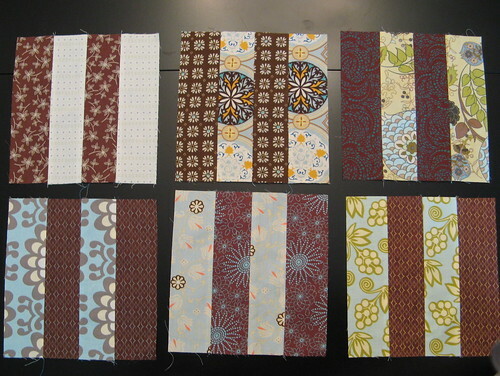 Then, I decided to join the Mod Sampler quilt along that Oh, Fransson! is hosting on her site. I’ve never done a quilt a long before, so it’s been fascinating to see the same pattern made by SO many people and it looks so different. It’s been a bit of a struggle for me because the pattern is not one that I would normally do. I’ve really debated over the sashing fabric. I’ve finally decided on a linen blend for the sashing. I’ve wanted to work with linen for clean lines and texture, so I’m going to take this opportunity to do so! I’ll use the pretty lemon fabric on the back. Now I just need to figure out what the main back fabric should be! Decisions, decisions! Here’s just a few of the blocks. They’re all very pretty and I love the fabric choices. 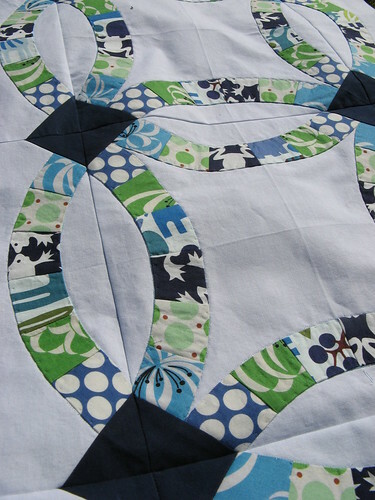 What advice do you have to someone who sews on a moderately well level, who has never attempted to actually quilt? If you don’t mind, I am going to add a link to your new blog on mine. I have your other one listed there as well. Things here are great~we are enjoying and loving the gorgeous spring Texas weather. Hopefully we will be able to plan a vist to see you two very soon! Christine, thanks so much for your sweet compliments! 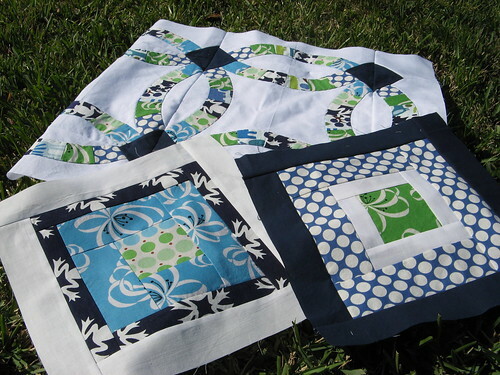 Are you interested in doing a quilt?! How cool is that?! I would recommend starting with a simple pattern and fabrics that you LOVE (because you’ll be staring at them for a long time and occasionally want to throw the whole project against the wall…it really helps when you love the fabrics LOL). I could definitely help you pick out a pattern. You could check out flickr and see what kinds of quilts you like. And check out my blog all you like. You have the privilege of being the very first to comment. HUG. I hope that we’re able to see you guys in person soon! I LOVE this double wedding ring pattern row you did. 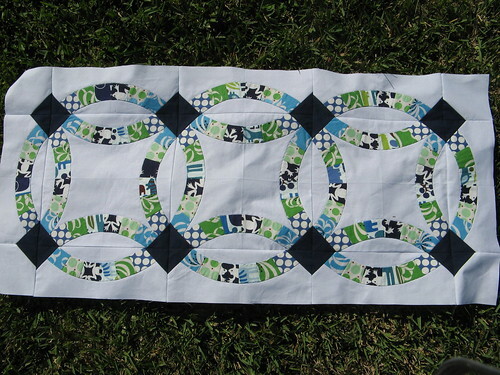 I found photos of it on Flickr while searching for modern quilts using white, navy, and green. You see a friend of mine is getting married and I'm considering making a quilt for her and her wedding colors are those I just listed. And so your double wedding ring row suits the bill PERFECTLY!! So I have to ask what pattern you used in hopes of getting it myself. Sorry if you already state this info somewhere and I missed it. You have a great blog by the way. Thanks so much for the inspiration!